(Canadian Cotton Sample Card). Color Card. Clark's Brilliant Crochet Cotton. Montreal, Toronto, Winnipeg, Vancouver: The Central Agency Limited, n.d. (191-?) 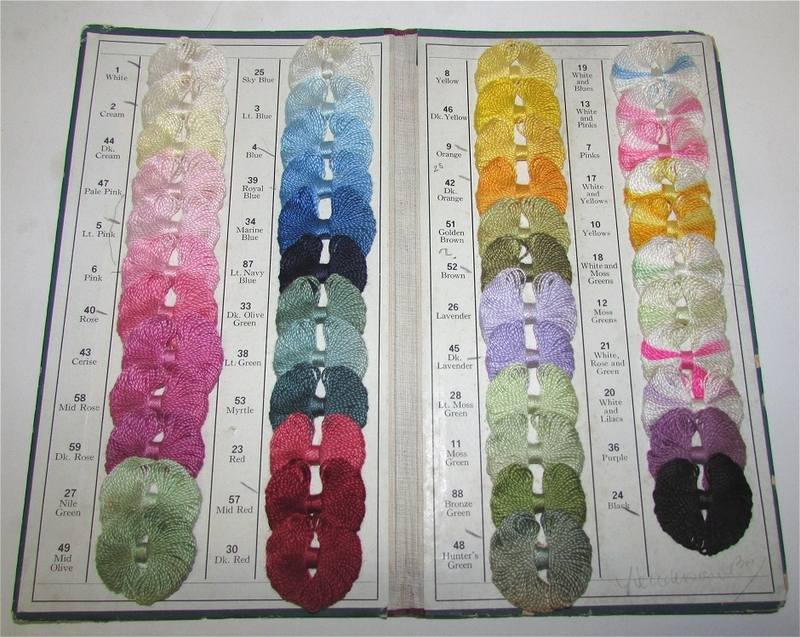 4¾” x 8½” (9½ x 8½ when open), printed paper boards with cloth hinge, complete with 47 sample bows of crochet cotton, each in a different solid colour (38 examples) or gradient (9 examples). A few of the samples show very minor discolouration, two puncture marks and scattered wear to boards, but still very nice with nearly all of the samples having retained vibrant colour. The Central Agency Limited distributed this American product to Canadian businesses from (at least) the turn of the 20th century. This card has been marked with pencil, indicating that the purchaser wanted to order White, Cream, Light Pink, Pink, Rose, Blue, Royal Blue, Mild Red, Orange, Dark Orange, Brown, Dark Lavender, Hunter's Green, and Black. A lovely example that shows the full range of available materials, and with annotations indicating what business chose to stock for Canadian women.